Emily Dickinson (1830–1886) may have lived in obscurity, but her poems have inspired a number of classical composers. 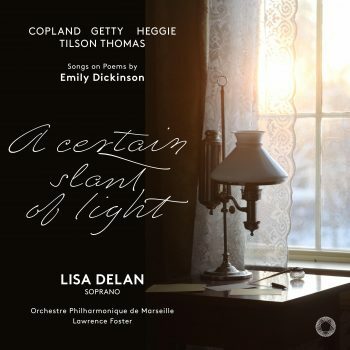 “A Certain Slant of Light” (on Pentatone) is soprano Lisa Delan’s recording of Emily Dickinson’s poems as set by four composers, with the Orchestre Philharmonique de Marseille conducted by Lawrence Foster. Copland later orchestrated eight of these songs, and these are what Delan sings on the album. The songs sound even more beautiful with such a rich backing. The mood changes from the lulling “Nature, the gentlest mother” to the lively “There came a wind like a bugle” and “Dear March, come in!” to the melancholy songs of death (“The world feels dusty” and “The Chariot”) and loss (“Heart, we will forget him”). Jake Heggie (b. 1961) is a prolific composer of operas and songs. He composed the cycle “Newer Every Day” for Dame Kiri Te Kanawa, accompanied by a pianist, and orchestrated them for this recording. The title comes from the Dickinson poem “We turn not older with years, but newer every day.” Surprisingly, that’s not one of the poems in the cycle. “Silence” has a sound similar to Gustav Mahler’s. “I’m Nobody! Who are you?” is as playful musically as are the lyrics. “Fame” has a repeated musical phrase that sounds as if it were taken from “The Bell Song” from Léo Delibes’s “Lakmé.” “That I did always love” is another work that suggests a romance in Dickinson’s life. “Goodnight” is rather upbeat, though the subject may be a farewell to life. Gordon Getty (b. 1933) is also a prolific composer of songs and operas. He composed “The White Election” (a cycle setting 32 of Dickinson poems). Four other songs set to Dickinson poems are included here, orchestrated by Getty for this CD. He creates a cathedral-like sound for “There’s a Certain Slant of Light” and ends with the same poem as Copland’s “The Chariot,” using the original title, “Because I could not stop for Death.” Including both versions shows how two composers can create compelling settings for the same words. The five songs by Michael Tilson Thomas (b. 1944) were written for and inspired by Reneé Fleming. He chose five short poems that highlight the poet’s more impudent and sardonic side. Thus, this is the happiest set, with the poet musing on the transient nature of fame, something she didn’t have to worry about. In another, she notes that “Beauty is nature’s fact.” In “Take all away from me” she asks to be left with Ecstasy. In all these songs, Delan produces a gorgeous sound, clearly articulates the text, and conveys the shifting tones and styles of the composers. Foster’s conducting of the Marseille orchestra is also admirable. 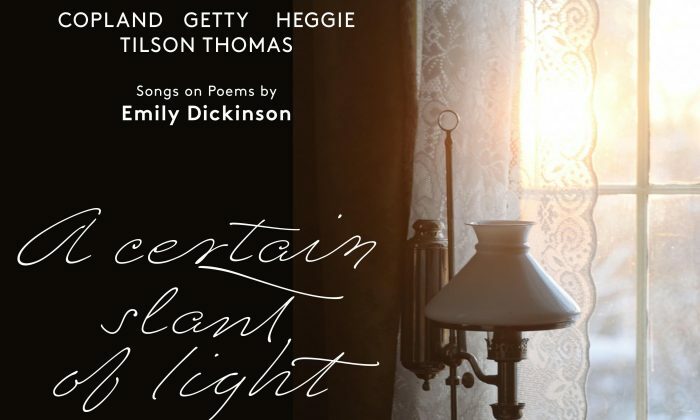 The CD booklet contains a statement from the singer describing her fascination with Dickinson’s poetry, starting at age 11. There is a scholarly essay on the works, as well as photos of Delan with each of the three living composers. The poems are also included with indications of points at which the sung text diverges from the originals. Lovers of art songs will enjoy this album.